This Book is unlike any colouring book you have seen. Each of these recently published books “Sights of Canada” will whet your appetite for exploring our vast and beautiful country. Colour, journal, sketch, scrapbook and create your personal journey. The experts tell us that colouring is good for our mental health. 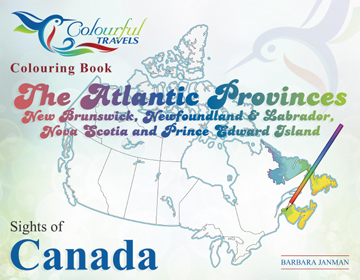 While being calming and dissipating stress this tour of places events and animals of Atlantic Provinces is also educational and creative while inspiring the curious to explore more of the province. This travel book will generate conversation among your family and friends, encourage you to visit new places or take you on a walk through memory lane. Make this an adventure of Colourful Travels. Made in Canada and created by artist Barb Janman.